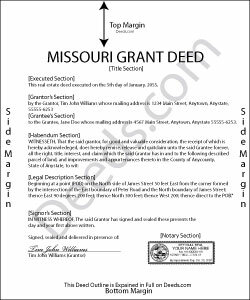 A grant deed in Missouri can be used to convey real property. The words "grant, bargain, and sell," when used in a conveyance, are construed to include the following expressed covenants from the grantor to the grantee: (1) That the grantor was, at the time of execution of the conveyance, seized of an indefeasible estate in fee simple of the premises being granted, (2) That such real estate was, at the time of execution of the conveyance, free from encumbrances done or suffered by the grantor or any person under whom he claims, and (3) For further assurances of such real estate to be made by the grantor and his heirs to the grantee and his heirs and assigns (442.420). Grant deeds will pass the after-acquired title of the grantor unless a different intention is expressed in the deed (442.430). A conveyance of land by grant deed should be executed in writing, signed by the grantor, and acknowledged or proved in the manner prescribed by Missouri Revised Statutes. Grant deeds recorded in St. Louis City should be signed by all parties. The officer taking acknowledgements or proof should have a certificate of acknowledgment or proof endorsed on the deed (442.180).Grant deeds that are acknowledged or proved within Missouri can be done so before a court or judge having seal, a justice or clerk of such court, or by a notary public. If acknowledged or proved outside of Missouri but within the United States, acknowledgments can be taken before any of the officers listed in section 442.150 of the Missouri Statutes (442.150). Every grant deed or other instrument in writing that conveys any real estate, or whereby any real estate is affected, in law or in equity, and is proved or acknowledged and certified according to law, should be recorded in the office of the county recorder in the county where the property is located (442.380). Once a grant deed has been recorded in the manner prescribed by law it will, from the time of filing with the county recorder, impart notice to all persons of the contents thereof and all subsequent purchasers and mortgagees are deemed, in law and in equity, to purchase with notice (442.390). A grant deed will not be valid, except between the parties thereto, and those who have actual notice thereof, until it has been deposited for record with the county recorder (442.400).